One of these discs includes an amazing hour long episode featuring The Police, filmed the day before their final concert at Madison Square Garden. Shot at the legendary Apollo Theater and 30 Rock's 8H Studio in New York, Spectacle blends the best of talk and music television. 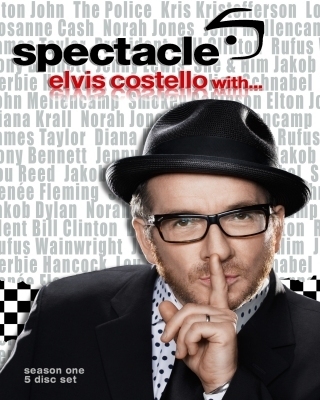 Rock & Roll Hall of Fame member Elvis Costello conducts insightful interviews and participates in once-in-a-lifetime musical performances and collaborations with the likes of Elton John, The Police, Tony Bennett, Norah Jones, James Taylor, John Melencamp and many more. This is an unprecedented series and a must for fans of every kind of music! Includes extended episodes with previously unseen footage, extra songs and behind-the-scenes interviews. Disc 5: Renee Fleming, Bonus songs, outtakes and backstage footage, rehearsal footage, stills gallery and more This beautifully packaged Collector's Edition 5 DVD boxset includes a 28 page colour booklet. Also available as a 4 disc boxset on Blu-Ray. Fresh off the concert trail together, Elvis and The Police team up for an action packed hour that includes individual interviews with Sting, Andy Summers and Stewart Copeland, as well as a raucous group session. It all provides a rare glimpse into the combustible chemistry that made The Police the biggest band in the world in the 1980s. In addition to illuminating talk, there's plenty of amazing music: Sting illustrates the original incarnation of 'Roxanne'; Sting and Elvis harmonise together on an Elvis gem; Andy and Elvis team up for a bit of jazz; and, for the finale, Elvis and The Imposters join forces with The Police for an unprecedented mash-up of a Costello classic and a Police essential.